A graduate of York and Ryerson University’s innovative Communication and Culture Master’s program, Aimee definitely knows the theory behind information sharing in today’s world. But she also knows the practice: her role as BaAM’s Communications Manager puts her right at the hub of business development and company communications, both internal and external. 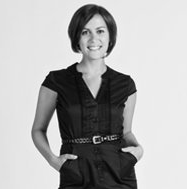 Poised and personable, Aimee is as comfortable writing proposals as she is managing BaAM’s online presence. She moves effortlessly between virtual and face-to-face communication, and brings to BaAM a fresh perspective and up-to-the-minute knowledge of culture and technology that helps BaAM stay connected to the next generation. Aimee also attends as many BaAM events as possible, armed with an iPhone to report on in-the-moment news. And when she can’t be there, she maintains contact with the BaAM team on-site to bring the “live” experience home … and share it with the virtual community. Happy to be “in the thick of things” at BaAM, Aimee enjoys being part of a team that keeps evolving with every new project.